The Order of Atonement of the Franciscan Minims of the Perpetual Help of Mary (mfPS) is a single Roman Catholic active/contemplative religious order distinguished by three (3) Branches: the Men's Branch for Priests and Brothers/Friars, the Women's Branch for Nuns and the Lay Branch for those of all ages and professions, including the sick, dying, and those children conceived but as yet "unborn" or "pre-born". During and after María Concepción's First Holy Communion (which her mother helped her daughter to make in secret because her father was a 33rd degree Mason and all the Catholic churches and schools in Mexico at that time were closed, and most priests, bishops and Religious had to go into in hiding  due to the violent slaughter of Catholics by government forces or "Federales" under the Calles government) the Real Presence of Jesus in the Eucharist spoke to little María Concepción and taught her the Faith and how to pray since she had received absolutely no religious education or catechesis at all during this time (1924-1928) of anti-Catholic, anti-Church religious persecution throughout Mexico by the atheist Mexican president Plutarco Elías Calles. Federales is a Spanglish word used in an informal context to denote security forces operating under a federal political system. The term gained widespread usage by English speakers due to popularization in such films as The Wild Bunch, The Treasure of the Sierra Madre, and Blue Streak. The term is a cognate and counterpart to the slang "Feds" in the United States. Jesus, also referred to as Jesus of Nazareth and Jesus Christ, was a first-century Jewish preacher and religious leader. He is the central figure of Christianity, and is widely described as the most influential person in history. Most Christians believe he is the incarnation of God the Son and the awaited Messiah (Christ) prophesied in the Old Testament. 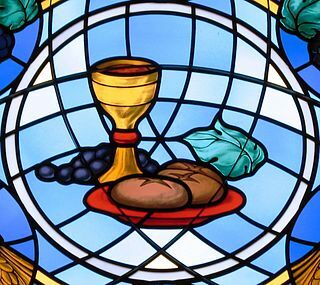 The Eucharist is a Christian rite that is considered a sacrament in most churches, and as an ordinance in others. According to the New Testament, the rite was instituted by Jesus Christ during the Last Supper; giving his disciples bread and wine during the Passover meal, Jesus commanded his followers to "do this in memory of me" while referring to the bread as "my body" and the cup of wine as "the new covenant in my blood". Through the Eucharistic celebration Christians remember both Christ's sacrifice of himself on the cross and his commission of the apostles at the Last Supper. A religious habit is a distinctive set of religious clothing worn by members of a religious order. Traditionally some plain garb recognisable as a religious habit has also been worn by those leading the religious eremitic and anchoritic life, although in their case without conformity to a particular uniform style. 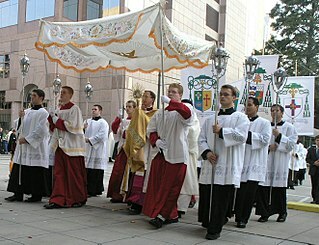 In the Roman Catholic Church, the term "congregation" is used not only in the senses that it has in other contexts, but also to mean specifically either a type of department of the Roman Curia, or a type of religious institute, or certain organized groups of Augustinian, Benedictine, and Cistercian houses. Venerable Mother María Luisa Josefa of the Most Blessed Sacrament, also called Mother Luisita was a Mexican Roman Catholic nun who founded the Carmelite Sisters of the Sacred Heart of Mexico and the Carmelite Sisters of the Most Sacred Heart of Los Angeles. The Blessed Sacrament, also Most Blessed Sacrament, is a devotional name used in the Latin Church of the Catholic Church, as well as in Anglicanism, Lutheranism, Methodism, and the Old Catholic Church, as well as in some of the Eastern Catholic Churches, to refer to the body and blood of Christ in the form of consecrated sacramental bread and wine at a celebration of the Eucharist. In the Byzantine Rite, the terms Holy Gifts and Divine Mysteries are used to refer to the consecrated elements. Christians in these traditions believe in the Real Presence of Jesus Christ in the Eucharistic elements of the bread and wine and some of them, therefore, practice Eucharistic reservation and adoration. This belief is based on interpretations of both scripture and sacred tradition. The Catholic understanding has been defined by numerous ecumenical councils, including the Fourth Lateran Council and the Council of Trent, which is quoted in the Catechism of the Catholic Church. Evidence of notable similarities exist in the founding of Opus Dei during the Spanish Civil War by Saint Josemaría Escrivá (1928); in the establishment of the Missionaries of Charity by Saint Mother Teresa of Calcutta (1946-1950), the founding of the Poor Clare Monastery of the Angels by Mother Angelica (1962) and Eternal Word Television Network (1981); the founding of the Home of the Mother on July 29, 1982 in Rome  by Fr Rafael Alonso Reymundo; in the establishment of the Order of Saint Benedict Daughters of Mary, Mother of Israel's Hope, Handmaids of the Family  by Mother Miriam of Immaculate Heart Radio, The Station of the Cross and Catholic Answers; the establishment in Vladivostok, Russia in 1991 of the Canons Regular of Jesus the Lord  followed in 2011 by the establishment of the CJD Canonissae in Jesu Domino or Sisters in Jesus the Lord,  and in the call of Pope John Paul II for religious orders to renew their communities which inspired the founding of the Franciscan Friars of the Renewal by Fr Benedict Groeschel, C.F.R. and seven (7) Order of Friars Minor Capuchin colleagues (1987); in the work of renewing Religious Life after Vatican II among the Dominican Sisters of St. Cecilia aka "the Nashville Dominicans", which led to new Religious foundations, including the Sisters of Life (1991) and the Dominican Sisters of Mary, Mother of the Eucharist (1996-1997) established by Cardinal John Joseph O'Connor; and many other extraordinary Works of Atonement worldwide including the United States pro-life movement, which began in the USA between 1967 and 1970, and other manifestations of the Work of Atonement in Rwanda, Japan, Vietnam, the Philippines, China, Russia, Korea, Eastern Europe and in many other countries. Church approval can be delayed whenever interior locution or visions of Jesus and Mary are alleged. María Concepción was favored from the time of her First Holy Communion with these more unusual supernatural gifts. In 1932, at the age of 18, while still living a secular life in her family home in Jalisco and ten (10) years before the First Foundation of the Order in Zamora, María Concepción had a Vision, after which she illustrated and explained the Symbolic Image of the Divine Justice. The Church gave its approval for the propagation of this Symbolic Image of the Divine Justice and the explanation of the Vision with several imprimaturs including the most recent imprimatur of Fidel Sta Maria Cortes Perez, the Bishop of Chilapa, who was appointed by Pope Paul VI in 1963 to protect the Second Foundation of the Order along with its growth in Mexico City after the Founding Nuns moved from their temporary residence in the Roman Catholic Diocese of Chilpancingo-Chilapa to property donated for a permanent Monastery in the Federal District in the Tepeyac hills behind the Basilica of Our Lady of Guadalupe. The Minims are members of a Roman Catholic religious order of friars founded by Saint Francis of Paola in fifteenth-century Italy. The Order soon spread to France, Germany and Spain, and continues to exist today. The Society of the Atonement, also known as the Friars and Sisters of the Atonement or Graymoor Friars and Sisters is a Franciscan religious congregation in the Latin Rite branch of the Catholic Church. The friars and sisters were founded in 1898 as a religious community in the Episcopal Church. The religious order is dedicated to the Blessed Virgin Mary under the Marian title of Our Lady of Atonement. Our Lady of Perpetual Help is a Roman Catholic title of the Blessed Virgin Mary as represented in a celebrated 15th-century Byzantine icon also associated with the same Marian apparition. Mary Theresa Ledóchowska, S.S.P.C., was a Polish Roman Catholic Religious Sister and missionary, who founded the Missionary Sisters of St. Peter Claver, dedicated to service in Africa. She has been beatified by the Catholic Church. The Diocese of Imus comprises the entire province of Cavite. The diocese was canonically erected on November 25, 1961, when it was excised from the Archdiocese of Manila. Imus Cathedral, located along General Castañeda Street in the poblacion of Imus, serves as the see of the diocese. It is one of twelve cathedrals founded by the Order of Augustinian Recollects in the Philippines. The Order of the Immaculate Conception, also known as the Conceptionists, are a contemplative religious order of nuns. For some years, they followed the Poor Clares Rule, but in 1511 were recognized as a separate Catholic religious order, taking a new Rule and the name of Order of Immaculate Conception. Mary Frances Schervier, was the founder of two religious congregations of Religious Sisters of the Third Order Regular of St. Francis, both committed to serving the neediest of the poor. One, the Poor Sisters of St. Francis, is based in her native Germany, and the other, the Franciscan Sisters of the Poor, was later formed from its Province in the United States. She was beatified by the Roman Catholic Church in 1974. Beatrice of Silva, O.I.C., also known as Beatriz da Silva y de Menezes and as Beatriz de Menezes da Silva, was a noblewoman of Portugal, who became the foundress of the monastic Order of the Immaculate Conception of Our Lady in Spain. She is honored as a saint by the Roman Catholic Church. Saint María Bernarda Bütler - born Verena Bütler - was a Swiss Roman Catholic professed religious and the foundress of the Franciscan Missionary Sisters of Our Lady of Perpetual Help, and a part of the missions in Ecuador and Colombia. Bütler worked for the care of the poor in these places until her exile from Ecuador and entrance into Colombia where she worked for the remainder of her life. Her order moved there with her, and continued to expand during her time there until her death. The Missionary of Jesus the Eternal Priest is a Roman Catholic religious order for women, founded by the Servant of God Mother Margherita Maria Guaini in May 1947, in Atella, Diocese of Melfi (Italy). The community moved to Varallo Sesia in the Province of Vercelli, where they were welcomed and supported by Mons. Gilla Vincenzo Gremigni, Bishop of Novara. Saint Maria Katharina Kasper – born Katharina but in religious known as Maria – was a German Roman Catholic professed religious and the founder of the Poor Handmaids of Jesus Christ. Kasper entered the religious life later in her life despite having harbored a desire to become a religious sister for a great period of time. It had not materialized earlier due to aggravating circumstances such as the Kaspers' poor economic status and the deaths of both a brother and her father. Her dedication to the poor and the ill was noted during the course of her life and dedicated herself to this work with great zeal. This article is a list of people proposed by each diocese of the Catholic Church for beatification and canonization, whose causes have been officially accepted by the Congregation for the Causes of Saints during the papacy of Pope Francis and are newly given the title as Servants of God. The names listed below are from the Vatican and are listed in month beginning the year 2013, with their birth and death year, position in clerical or religious life, and the place where the saint-to-be lived or died. Saint Rafaela Porras Ayllón was a Spanish Roman Catholic professed religious who established the Handmaids of the Sacred Heart of Jesus in conjunction with her sister; upon becoming a nun she assumed the religious name of "María of the Sacred Heart of Jesus". She was a nun for most of her life and devoted herself to the management of the congregation and resided in Rome until her death after her resignation as the order's superior in 1893. Blessed Manuela de Jesús Arias Espinosa – in religious "María Inés Teresa of the Blessed Sacrament" – was a Mexican Roman Catholic professed religious and the founder of both the Poor Clare Missionary Sisters of the Blessed Sacrament (1945) and the Missionaries of Christ for the Universal Church (1979). She lived during the time of the Cristero War and remained out of the nation during some of it in order to avoid the anti-religious persecution of the times. 1 2 3 4 5 6 7 8 9 10 María Concepción Zúñiga López. My Best Book. ESTRELLA Magazine, Mary Conzulo. ↑ "Timeline" . Retrieved 19 May 2017. ↑ "Mother Luisita". 14 July 2012. Retrieved 6 November 2016. ↑ "Dictionary : PIOUS UNION" . Retrieved 6 November 2016. ↑ "Home of the Mother" . Retrieved 6 November 2018. ↑ "Daughters of Mary, Mother of Israel's Hope" . Retrieved 6 November 2016. ↑ "Canons Regular of Jesus the Lord" . Retrieved 6 December 2016. ↑ "Sisters of Jesus the Lord" . Retrieved 6 December 2016.